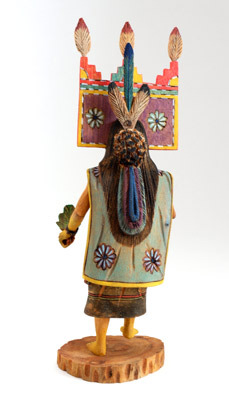 Dressed in a tan ceremonial robe and kilt with embroidered borders, and wearing an elaborate painted tablita with feathers on her head, the Palhik Mana, known also as the Water Drinking Girl and/or the Butterfly Girl, is a dancer, rather than a true kachina. She is holding eagle feathers in her hands. Central to the traditional religion of the Hopi people of the Northern Arizona are Kachinas. 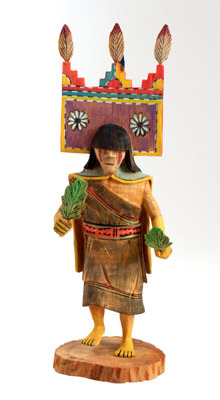 A Kachina (Katsinas) is a supernatural being relied upon to provide rain, fertility, health, and well being. 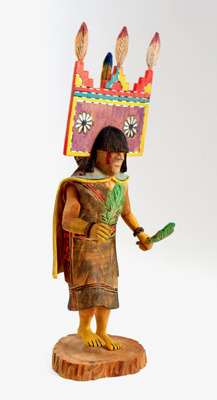 While kachinas play a role in many of the Pueblo societies, the Hopi are most noted and prolific today in kachina doll carving. Each year in elaborate ceremonies, men of the Hopi villages dress and mask themselves for ritualized dances to represent and call on the different Kachinas. 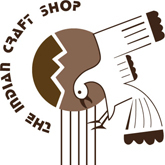 Kachina dolls are carved from cottonwood root and have long been used to instruct Hopi children in the ways of the traditional religious cycles, and to help them learn to identify the hundreds of different beings. The carvings convey the movement of the dancer, and the specific particulars of the mask, costume, and accessories. 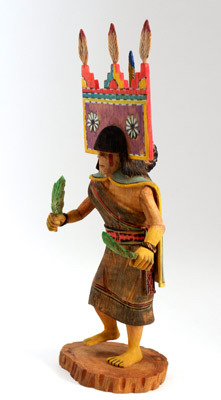 In addition to kachinas, Hopi artists also carve figures from Hopi mythology and folklore as well as other Pueblos dancers. Height: 9.25", Width: 3.5", Depth: 3"